With Memorial Day coming up, I thought I’d share one of my favorite springtime pasta recipes. This dish is on the “lighter” side of pasta, like a pasta salad. Serve it piping hot or at room temperature. The fresh, zingy flavor of garlic, lemon, and red pepper brings life to the nutty flavor and creamy feel of the garbanzos. A delicious addition to your buffet table! The recipe calls for flat leafed parsley, but you can substitute cilantro for even more snap. 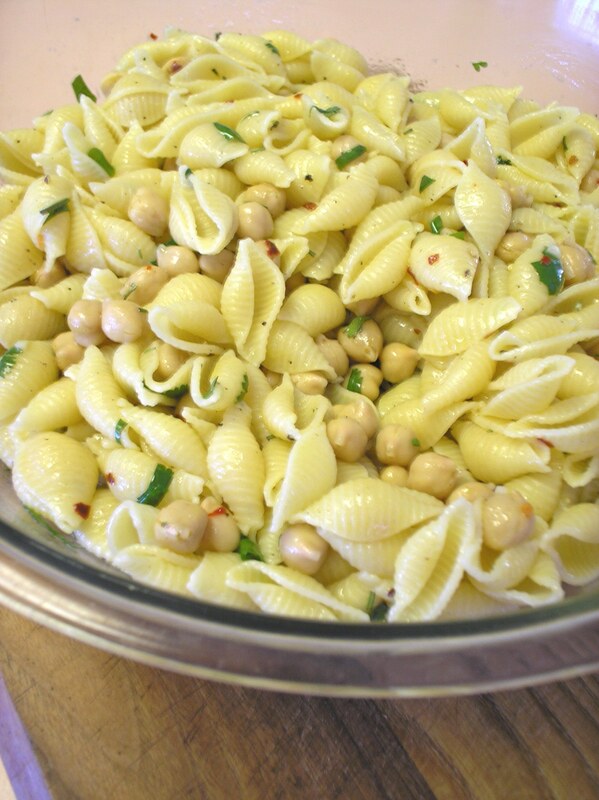 Combine chickpeas, olive oil, garlic, crushed red pepper, lemon zest, lemon juice, salt, and pepper in a pasta serving bowl. Set aside to warm to room temperature. Cook pasta in large pot of boiling, salted water until al dente. Drain pasta well and add to sauce in bowl. Sprinkle with rosemary, parsley, and green onion and toss. Taste-test, adjusting salt and pepper as needed.